The dense network of trails tells of a recent past full of sheep farming and agriculture. A time when the transport used to take place by mule. Today all those old paths are wonderful mountain biking trails. They lead to the summit and then descending to the sea for an unforgettable experience. 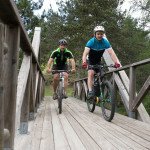 A team of bike guides will lead or help you in getting all the necessary services you may need: cartography, shuttle service, luggage transport.